Rigid Industries Marine Dually XL Series Pair White LED Flood Lights. Includes:Harness, Bracket, and All necessary mounting hardware. Dually XL Series - Not too BIG and not too SMALL... The all new Dually XL Series. Everything you expect from the innovative D-Series is now available in a bigger and brighter package. With its unbreakable polycarbonate lens, durable UV-resistant polyester powder-coat, stainless steel hardware, and vibration isolator, the Dually XL utilizes patented Rigid Industries optics that project high intensity LED light with more output for use in any application. The Dually XL Series is available in all optics and marine applications. Our ever evolving technology, advancements in quality, tight top shelf binning QC on LEDs from only leading manufacturers with our secret sauce of optics and PCBs that make the LED perform to it max and last its max lifespan all housed in our torture tested housings makes all the difference in our products. Items must include all original packaging. 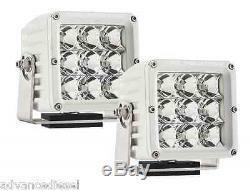 The item "Rigid Industries Marine Dually XL Series White LED Flood Lights Pair 32411" is in sale since Friday, June 05, 2015. This item is in the category "eBay Motors\Parts & Accessories\Car & Truck Parts\Lighting & Lamps\Fog/Driving Lights". The seller is "advancediesel" and is located in Angleton, Texas. This item can be shipped to United States, Canada.